The RAEviewer - A blog about luxury and high-end cosmetics: OPI Glitzerland - Lots of Glitz & Even More Glamour! OPI Glitzerland - Lots of Glitz & Even More Glamour! *I included the last photo, even though it is slightly out of focus, because the other photos were not able to capture the glitter's iridescence properly! 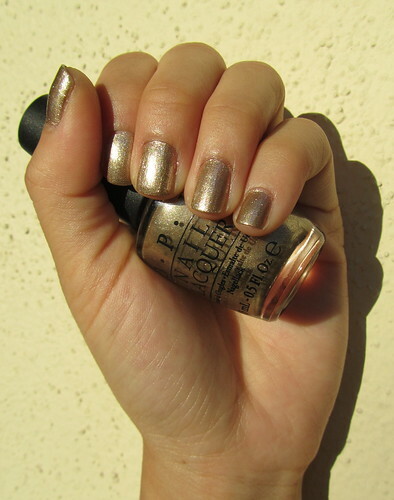 OPI Glitzerland was launched this Fall of 2010 with the Swiss Collection. Collection Thoughts: The Swiss Collection is hefty, with twelve colors to choose from. I was only attracted to three colors but wound up purchasing two. [Yes, I took one out.. SELF-CONTROL!] I can't necessarily pinpoint the Swiss inspiration in the colors, other than the inclusion of red from the Swiss flag, but at least the names of the polishes are cute and memorable! Color & Finish: Glitzerland is a champagne gold with a slightly beige base color and it as glitzy as the glamour girl in each of us could ask for! As you can see in the above photos, the polish appears to have a metallic finish in the shade and in natural light. The shimmer looks more subdued and leans toward the effect of a fine glitter foil. In the sunlight, however, Glitzerland really comes to life.. just like Paradoxal! The multi-faceted reflects of the glitters provide a hippity-hoppity show of rainbow-colored shooting stars for our eyes to take in with glee *tehehe* That's why it would make such a fabulous top coat for other polishes! Dupe: Orly Luxe is the more intense, metallic version of Glitzerland. Luxe, however, has fewer iridescent glitter particles. Glitzerland is also a bit more beige while Luxe looks more like a true yellow gold against my hands' skintone. I will be reviewing Orly Luxe next so that you can see the differences. Personally, I find Glitzerland more wearable on a day-to-day basis. Verdict: I feel that Glitzerland is the only must-have polish from the Swiss collection. I picked up another polish from the collection, Lucerne-tainly Look Marvelous, but I prefer Glitzerland, as it can be worn all year round! That color is gorgeous on your nails Rae! I wish I could pull off gold on my fingernails but since I'm quite tan at the moment it makes my hands look really yellow >_<. Don't you just love OPI's nail polish names? So fun! The colour is so gorgoes on your nails.I love how the glitter reflects the lights and shows multiple glitters within one! omg i'm in love with the colour! gorgeous :D it's definitely on my wishlist! Very pretty! I like gold fingernails!